WHAT IS MRA GUI Engine (GUI-E)? 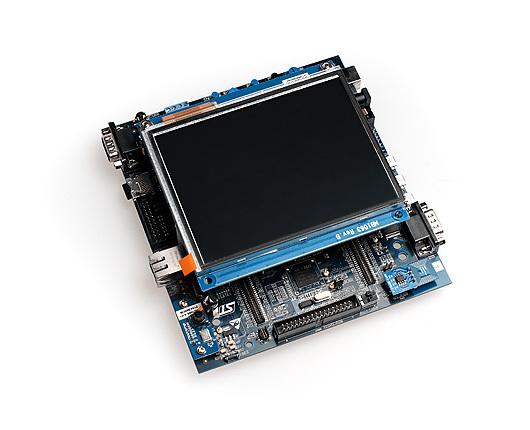 MRA Digital's GUI-E is a lightweight embedded library for displays and touchscreens providing everything required to build a fully featured embedded GUI. The library is very small and fast because every unused feature is disabled and not linked into the finished binary. The GUI-E library has been designed to be the smallest, fastest and most advanced embedded library for display and touchscreen solutions. Fully multi-threading re-entrant. Drawing can occur from any thread, at any time! 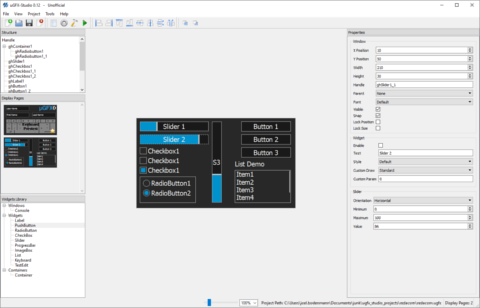 GUI-E-Studio is a desktop application that provides an intuitiv drag'n'drop interface to quickly assemble a graphical user interface. The GUI-E-Studio runs on Windows, Linux and Mac OS X. The GUI-E library works on any processor architecture. No matter whether it's a small 16-Bit microcontroller, FPGA or a huge 64-Bit multi-core ARM CPU. The GUI-E library runs on any system. It can be used with or without underlying operating system. No matter what system you've got - GUI-E will run on it. From the smallest, lowest-power microcontroller to the fastest, multi-core systems - GUI-E will run on it. 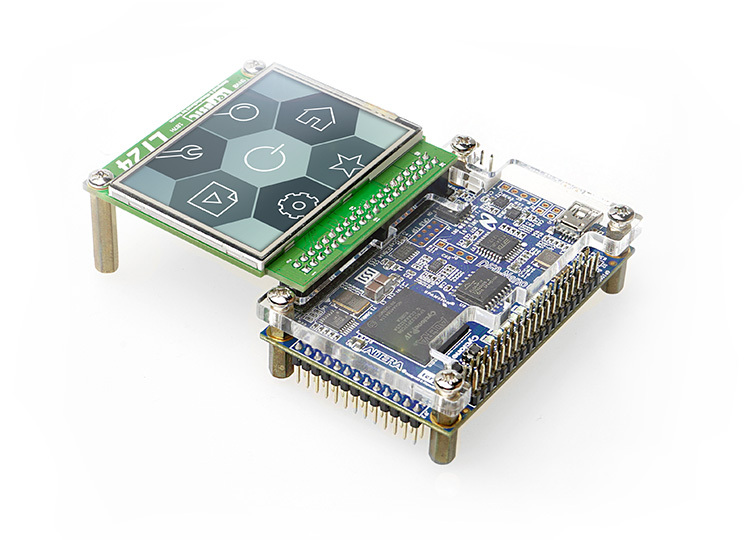 How can GUI-E be completely portable while offering the smallest and fastest embedded graphics solution on the market? An easy to use, yet highly flexible abstraction layer allows to run the GUI-E library on virtually any platform. The abstraction layer has been designed to have as little performance impact as possible. Every unused feature is disabled. Disabled features are not getting compiled and don't end up in the finished binary. Therefore, GUI-E code is always as small as possible. Wherever possible we provide hardware acceleration interfaces to get the most out of your hardware. We frequently perform rigorous tests where we literally copy-paste code and run it on different platforms to ensure that the library meets our high quality demands. The GUI-E library has a huge list of different features which make it what it is - the best embedded library for display and touschreen purposes. We save every byte of memory and every CPU cycle we can. GUI-E is small and fast. 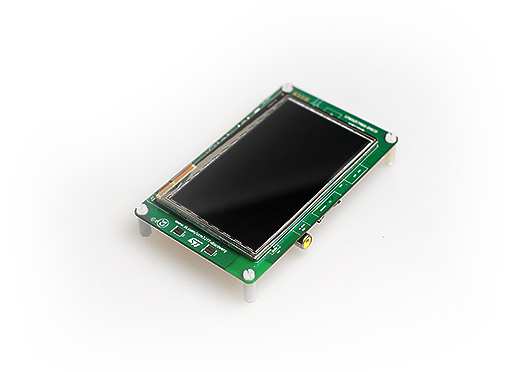 Monochrome, grayscale, color, resistive, capacitive or no touchscreen at all... GUI-E will run on it! Advanced text rendering features such as anti-aliasing, unicode and kerning support. Take advantage of hardware acceleration wherever possible.